What is the maximum quantity of contacts in an SMB Workspace account? How can I add contacts from my Workspace to my private FullContact account? How can I bulk-add contacts from my Workspace to my private FullContact account? Are changes made to shared contacts reflected in my private account? Are all my contacts being shared with my Workspace? Can I import contacts directly into my Workspace? How can I see which contacts I have added from my private FullContact account to my workspace? How can I add contacts from my private FullContact account to my workspace? Can I delete or remove a contact from my workspace contacts? Can I merge contacts on my workspace? How are my workspace contacts being sorted? 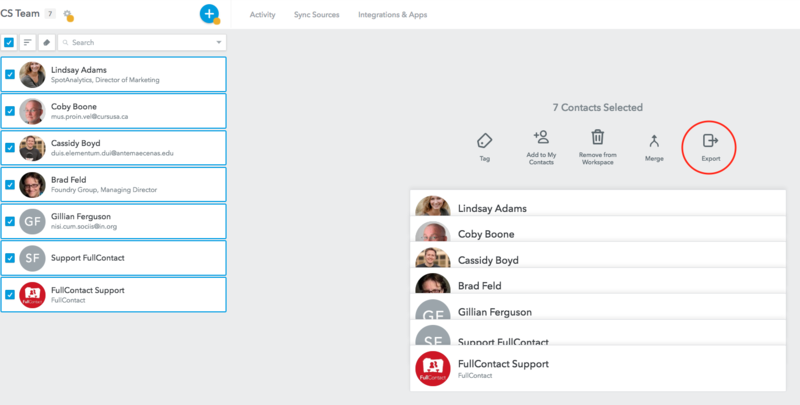 What FullContact apps support FullContact Workspaces? Can I export contacts from my workspace? The maximum quantity of contacts you can share from your personal address book to your team's contacts is 25,000. The maximum quantity of contacts shared amongst all of your team members is no greater than 25,000 x the number of team members on your team. This means, 25,000 contacts per member of a team are allowed. Click on the Update to My Contacts button in the upper-right-hand corner of the contact’s details; this displays as a [...] icon. This contact should then also be available to you in your private address book. This will update matching contacts or add any new contacts. 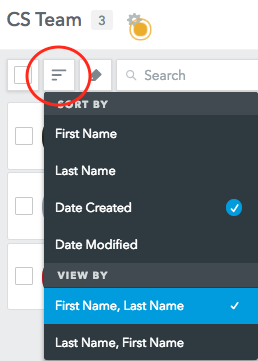 You can check the box next to each contact's name that you want to add to your private FullContact account, then click Update My Contacts to bulk-add them from your team to your My Contacts. This will update matching contacts and add any new contacts. In order to keep your private contacts separate from shared contacts and prevent corruption of contact data, changes that are made to your private contacts within your team account will not write back to your private account or update the private accounts of other members who are also sharing that particular contact. In essence, changes made to contacts in your team account will only update the shared contact database, whereas changes made to your private contacts will only update your private contact database. If you want the contact changes in the team to sync back to the same contact in your personal contacts, you'll have to click the Update My Contact button. Here's an explanation of the most common situations which you may encounter while using FullContact for Teams - Teams & SMB shared contacts data flow. You have the option to choose. You can either share All Contacts in your private FullContact address book OR you can select Specific Contacts. During the onboarding process for teams, you can choose which contacts you'd like to share. Otherwise, you can adjust this later under the Gear Icon on your workspace - Sharing Preferences. Yes. Press on the + sign you're seeing next to the Gear Icon, then choose Import File. You can upload CSV or .VCF files. Click on Tags in the upper right-hand corner of your Web app, then click on Added to Workspace. You can either add contacts individually; or, you can bulk-add contacts to your workspace. Click Add To Workspace and your contact will be shared with your team. Select two or more contacts and click Add to Workspace to share the selected contacts with your workspace. Yes, you can remove a contact from your workspace contact. First, select the contact; then, click on the three small dots in the upper right-hand corner. If you want to delete a contact entirely, this can be done in the personal contacts only. Alternatively, you can simply remove a contact from the team so that it is no longer being shared. You can do this via the three small dots in the upper right-hand corner or by selecting the contact from the left-hand side. You can also select multiple contacts to remove them from the workspace in bulk. Keep in mind that you can remove a contact from your team even if you haven't added this contact to your private FullContact account. Yes. You can check the box next to the contacts you want to merge, then click Merge. Your workspace contacts are sorted by a variety of different parameters that include: name, date created, or date modified. You can change how your workspace contacts are sorted at the top of your contact list. Can I filter shared contacts by an individual workspace member? Unfortunately, not at this time. 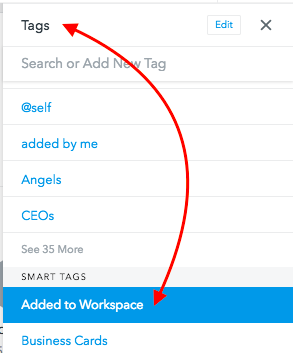 However, we recommend that you set up a workspace tag for each member. That way, they can add their contacts to the tag once their private contacts have been shared. Then, they can filter accordingly. Whether you have downloaded FullContact for iOS, FullContact for Android, installed FullContact for Gmail or use the FullContact Web App, you can access your shared contacts in these apps. Yes. To export your contacts, check the box next to each contact's name that you wish to export (in the FullContact for Web app), or you can click Select All at the top of your workspace contact list to export all contacts in your team. Once you select your contacts, click Export. You can also choose to export any of your shared (workspace) tags. To do so, click the Tags icon in the upper left-hand corner, select your workspace tags, choose the tag you wish to export, then click Select All at the top of your contact ist -> click Export. You can view this article to learn more about exporting from FullContact.